As you can read in the official website , the Teatro Puccini was inaugurated as Theatre of the OND of the State Monopoly, in 1940. After the war it was used as a dance hall and also rented for boxing matches. After a period of stagnation, which lasted four years, the theater was reopened from 1964 until 1972, carrying out a predominantly film, except for a few evenings of theater. As of the 1991-92 theater season, will also open as a permanent theater. 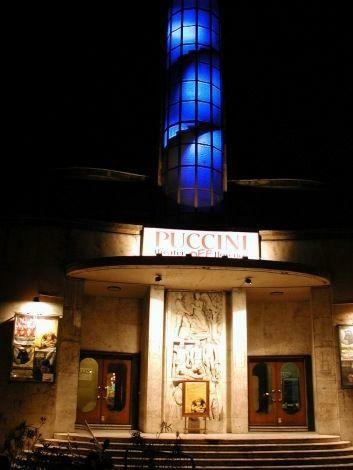 Thus it was born the Puccini Theatre - Repertory Theatre of Satire and contamination of genres, founded and designed by Sergio Staino who holds the leadership until January 1999. With its 120 days of the year show, organized both in headquarters and in other structures of the city (mainly at the Teatro Verdi, at the Nelson Mandela Forum and Obihall), the Puccini Theatre is at city and regional level a major point of reference to an increasingly broad and diverse audience basin. The planning carried out since 1991 can be simplified in the "stable formula Theatre of satire and contamination of genres." A stage that gives space to the traditional presence of "indomitable satyrs" and "irreverent comedy" and opens to new and challenging comparisons with authors and actors of the new Italian dramaturgy - in new languages ​​and style, original choices and projects, different and away from the forms and from research that they characterize and characterize the avant its aspects, which in Florence his legitimate theatrical spaces. A space that in recent years has seen the presence of shows and artists of undisputed quality and renown such as Marco Paolini, Paolo Rossi, Beppe Grillo, Dario Fo, Franca Rame, Moni Ovadia, Lella Costa, Paolo Hendel, Antonio Albanian , Aldo, Giovanni and Giacomo, Claudio Bisio, Paolo Poli, Mario Scaccia, Alessandro Benvenuti, Daniele Luttazzi, Job Covatta, Alessandro Baricco, Ascanio Celestini, Alexander Berger, Gabriele Vacis, Leonardo Pieraccioni, Ale & Franz, Ficarra & Picone, Giorgio Panariello and many others who have made this stage the "off" theater of Florence. The results obtained by the Association in these years were considered excellent both from a qualitative point of view and organization to such an extent that the City Council has turned the association, for the direct management of high cultural value. Of particular note in 2006 the following events: "Florence welcomes Mario Rigoni Stern. A four thousand kilometers from home ", a review that included exhibitions, meetings, theatrical performances among which we remember" The Sergeant "with Marco Paolini and culminating with the awarding of honorary citizenship to Mario Rigoni Stern; "The right to live in the present", a series of outright Giorgio Gaber and finally "4 November '66. The large Arno War "by Francesco Niccolini Sandro Lombardi, Anna Meacci and Marco Paolini, one event-play performed at the Teatro Verdi in Florence to commemorate the 50 years from the flood of Florence.